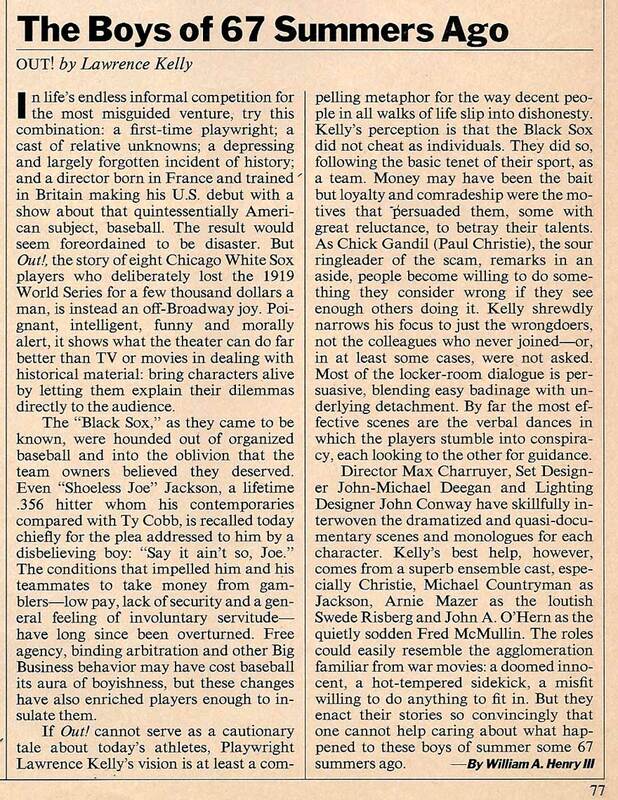 IN a time of multi-million-dollar contracts, high-powered agents and revelations of drug abuse among baseball players and other athletes, there is something decidedly old-fashioned - but still shocking - about returning to the subject of the Black Sox scandal, in which eight players on the Chicago White Sox were banned from baseball after being accused of throwing the 1919 World Series to the Cincinnati Reds. As detailed in Lawrence Kelly's intriguing new play, ''Out!,'' the issues behind the scandal were relatively simple. Players, including such stars as Shoeless Joe Jackson, were woefully underpaid. Baseball was a national institution in which the primary parties were treated as children, incapable of handling their own destinies and unworthy of receiving adequate compensation. The story of ''Out!'' is largely one of greed mixed with pride. Mr. Kelly's play poses no dense, Faustian conflict between faces of good and evil. On its own terms, however, it is a straightforward report of the major facts and the general surmises, as dramatized by the author. Within chosen boundaries, ''Out!'' fulfills its purposes. 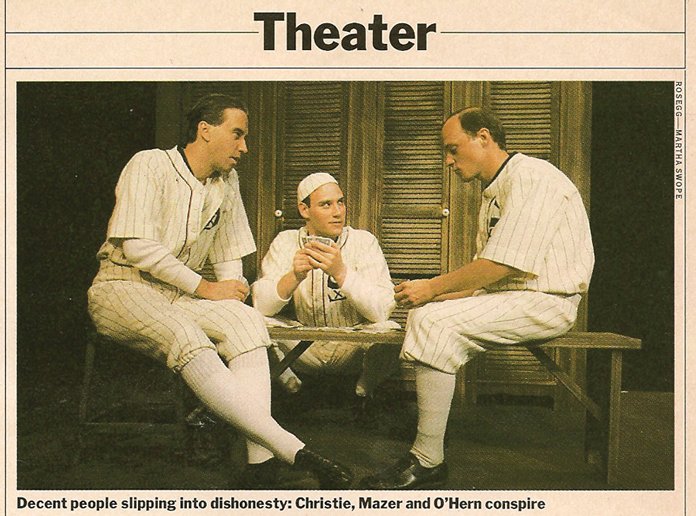 Through a well-told accounting of an infamous past, the play makes us think about baseball's present - and future. The eight players neatly cover many bases of characterization; each has a differing attitude toward the sport. 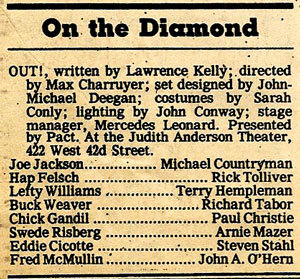 The team's star is Jackson, played by Michael Countryman as a kind of Lou Gehrig natural who seems to spend most of his off-diamond time visiting youngsters in hospitals. Such was Jackson's own baseball ability that even in the Series he supposedly helped to fix, he succeeded in batting .375. Jackson's opposite is Chick Gandil (Paul Christie), a slick opportunist known for associating with gamblers. Gandil's sidekick (Arnie Mazer) acts as his advance man, saying out loud what the other man is thinking. Together the two actors play a strong-willed pair of conspirators, as they plot an insidious course to corrupt their fellow players. They know if Jackson falls to their side, the team will follow. In Mr. Countryman's articulate portrayal, we can read the growth of a good man's temptation, as a hero wavers to the side of sin. 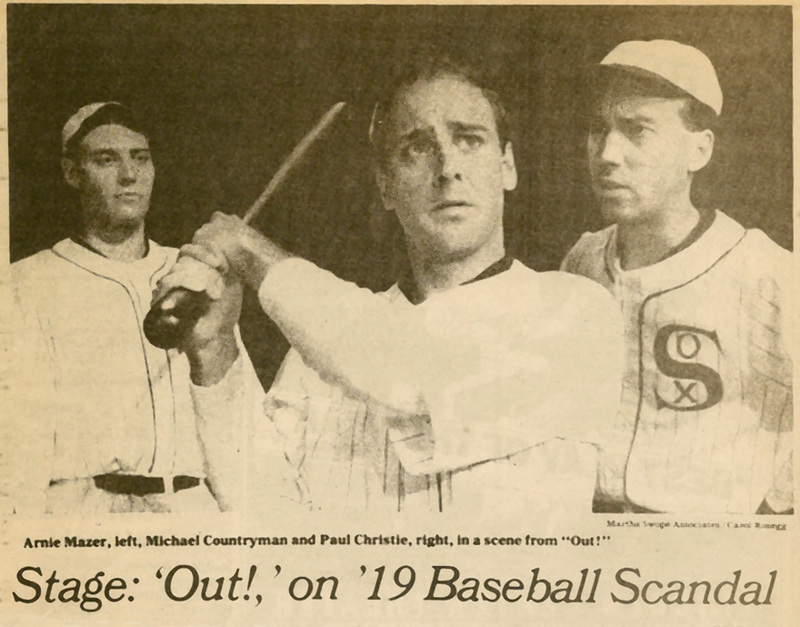 In the case of Eddie Cicotte (Steven Stahl), the team's top pitcher, the issue is even more clearcut. He has won 29 games. The club owner has promised 30-game winners a bonus, but appears to hedge against that promise by refusing to let Cicotte pitch again before the World Series. What Mr. Kelly chooses to tell us in this, his first full-length play, he dramatizes effectively - through testimony directly addressed to the audience and scenes in the locker room. The staging by Max Charruyer is constructive, and the young actors, all eight of them, seem like ballplayers. They are convincingly in character and in period.